An illegal immigrant escaping the troubles in Belfast, young Michael Forsythe is strong and clever and fearless – just the man to be tapped by crime boss Darkey White to lead a gang of Irish thugs against the rising Dominican powers in Harlem and the Bronx. The time is pre-Giuliani New York, when crack rules the city and hundreds are murdered every month. Michael and his lads tumble through the streets, shaking down victims, drinking hard, and fighting block by bloody block. Soon Darkey anoints Michael his rising star. But when Michael seduces his boss’s girl, the saucy, fickle Bridget, things quickly go south – south to Mexico, that is. Double-crossed and left to die in a Mexican prison, Michael plots his return to New York, there to wreak terrible vengeance on his betrayers. 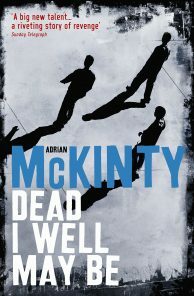 A natural storyteller with a gift for dialogue, McKinty delivers the explosive underworld of organised crime, complete with Irish lilt.